With the holidays rolling around, you're probably worrying just a bit about your waistline. When it comes to dieting, we all know that meal size matters: eating less calories than you expend will slim you down. Far more controversial is whether timing matters as well. One popular camp believes that it doesn't: midnight snacking's fine as long as it fits into your daily caloric limit and macros. Personally, I sit with the other camp: when you eat matters, both in terms of the absolute timing of the day, and the relevant timing to your last meal. In order to adapt to daily fluctuations in food availability, our metabolisms ricochet throughout the day in feeding-fasting cycles that couple to our circadian rhythm. Disruptions to this coupling – say, eating in a sleep-promoting state during nightshifts – seems to negatively impact metabolism and promote weight gain. But observational studies can't tell us why: is it because of increased caloric intake, or disrupted metabolic cycles? A study in mice in 2012 tried to answer this question. Researchers put young adult male mice on a high-fat diet (61% energy from fat), and gave them either 24/7 access to the tasty morsels, or limited their feeding to a 8-hour time window – a practice called intermittent fasting. A separate group of control mice was fed normal mouse chow (13% energy from fat) with the same two schedules. Eighteen weeks later, the researchers thoroughly examined their body weight, metabolic profiles and circadian regulation. A striking difference. FA: all-you-can-eat, high fat diet. FT: time-restricted, high fat diet. NA: all-you-can-eat, normal chow. NT: time-restricted normal chow. Although both high-fat groups ate a similar number of calories on average each day, their health profiles dramatically differed. The all-day-nibblers were in shambles: their weight nearly doubled, their body fat percentage skyrocketed, and they showed a disturbingly wide array of health issues including disrupted metabolic and circadian cycles, glucose intolerance, inflammation, liver damage and even impaired motor control. Mice on a high-fat, intermittent fasting schedule were in much better shape. Sure, they gained weight, but not much more than mice given all-you-can-eat normal chow (graph above), perhaps partly due to increased activity levels and energy expenditure every night. They were also completely protected from all the health detriments that plagued their high-fat buffet consuming counterparts, and performed even better than normal chow-eating controls on a motor balancing test. (No word whether these mice were in ketosis.) The results are really quite remarkable, considering that both high-fat groups ate comparable amounts of calories each day and only differed in the length of their fasting periods. Eating "on time" is protective because the everything's functioning in sync, the authors explained. When you eat within a consistent time window, you're body knows when food's coming. Intermitted fasting entrains both circadian and metabolic rhythms to scheduled feeding times, so that the body is prepped to optimally digest and utilize food calories. The regime seems to be enormously forgiving against a diverse range of dietary atrocities. In a new study recently published in Cell Metabolism, the same group tested the limits of daily fasting in fighting against health problems from unhealthy eating. They subjected nearly 400 mice, both normal weight and obese, to a range of diets and intermitted fasting schedules, and profiled their metabolic fitness at the end of the study. Daily caloric consumption was similar between time-restricted and all-you-can-eat mice, regardless of diet. Whichever the diet – high-fat (60% energy from fat), high-fructose (60% energy from fructose), or high fat-and-sucrose (30%+25%) – mice subjected to intermittent fasting gained less weight and body fat than their grazing counterparts (middle part of graph below). The benefits of fasting increased with the length of the fasting window: mice on a 9-hour fasting window had 17% more weight gain than those that fasted 15-hours. As in the previous study, with respect to an all-you-can-eat control mouse on the same diet, fasting reduced inflammation and insulin resistance, and improved exercise endurance, liver function, cholesterol maintenance and protein metabolism. The slimming effects of fasting seems to stick around. 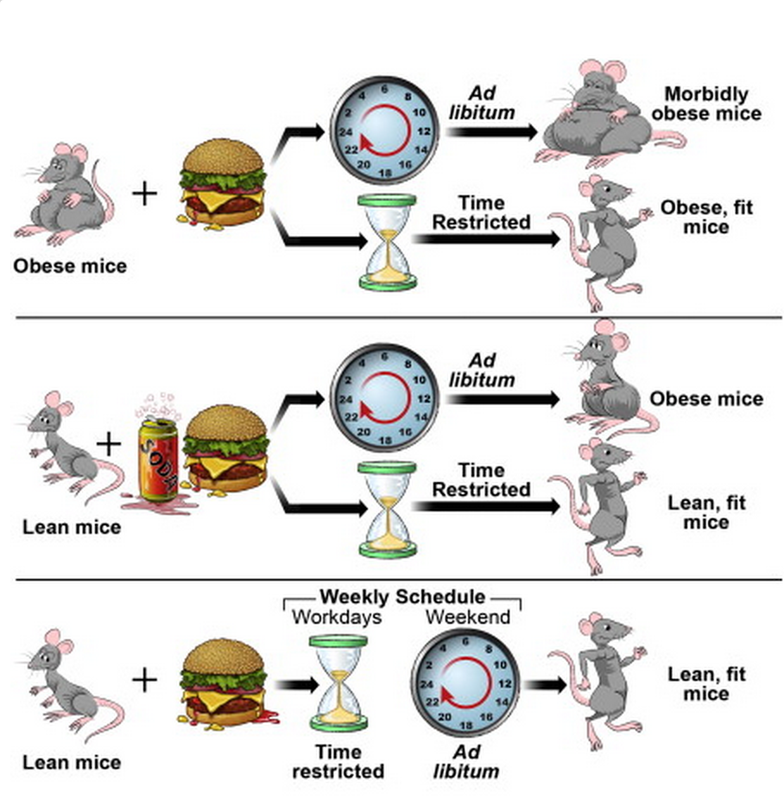 In one group of mice, researchers allowed them two glorious "weekend" days of full access to a high-fat diet while restricting their feeding windows on the other five "weekdays". Although these mice ate around the clock on weekends, they gained less weight than mice that had access to the same high-fat diet the whole time – even though they consumed comparable calories (bottom part of graph below). What's more, the gene expression patterns of these "weekend bingers" looked similar to mice on a 7-day restricted feeding schedule, suggesting that the diet can withstand occasional disruptions. Completely transitioning mice from a restricted to nonrestricted feeding schedule, however, blunted the former's health effects. On the other hand, limiting feeding time in obese mice helped combat their existing health problems. The regime worked better for younger mice: when restriction began at 25-weeks old, they ended up with a similar body weight as normal-weight mice maintained on the restricted feeding schedule. If the intervention started at 38-weeks old, however, the time-restricted regime only partially reduced excessive weight gain, but did prevent the mice from further packing on the pounds and corrected their metabolic problems (top part of graph below). It's either young age or relatively less body fat that's causing the difference, the authors said, older mice may need further intervention. Intermittent fasting doesn't only protect against a bad diet, it can also benefit a balanced one. Although the body weight of mice fed a normal diet with different schedules didn't differ, those on a limited eating window had more lean mass and less body fat than all other groups. The benefits didn't stop there: fasting also protected the mice's livers from age-related damage. Here's a summary of all the data, courtesy of Cell Metabolism. All of the data in a nutshell. "Ad libitum" means all-you-can-eat. How does intermittent fasting, without reducing overall calorie intake, promote these health effects? A comprehensive analysis of blood metabolites revealed elevated antioxidant and reduced inflammation biomarkers – something the researchers are interested in pursuing in their future work. In addition, the challenge of daily fasting puts an adaptive stress on the body, which leads to hormesis – that is, when exposure to a mild stress causes cells to become more resilient against severe stress (basically, what doesn't kill you makes you stronger). Fasting also tells the cells to synthesize more mitochondria – our cellular energy factories, promotes efficient energy use, and sweeps away damaged molecules and cellular components in a process called autophagy. That said, whether intermittent fasting benefits healthy, adult humans remains to be seen. Although there is accumulating evidence that the regime improves health indicators in obese individuals, there's simple not enough data to draw conclusions for normal weight subjects (anecdotes aside). Compared to lab mice, humans are highly heterogenous in terms of our genetic makeup and epigenetic landscape, as well as the environments that we've been exposed to throughout our lives. Simply changing when we eat isn't going to be a cure-all. But the potential is certainly there, and not just for weight loss. Intermitted fasting was featured in a symposium at the Society for Neuroscience annual conference this year for it's beneficial effects on brain health through life (write-up of the symposium is here), and highlighted in a review paper in PNAS, a top-tier journal. Regardless of whether this research crystallizes into dietary guidelines and health benefits in humans, it certainly makes me rethink some popular advice currently in the media, such as "eating breakfast promotes health" and "spread your meals throughout the day".